What is the Best Tile and Grout Cleaner in Boulder, CO 80301? From doityourself.com. For more articles like this, go to Helpful Home Articles. · Clean the grout first with water and allow to dry. This will remove any loose surface debris. · Never use bleach on colored grout, as it will discolor the grout. · Use a stiff brush for scrubbing. Old toothbrushes will be too soft. Also avoid using metal bristles, as they will wear away the grout. · If you're using commercial cleaners, bleach, or other chemicals, make sure the room you're working in is well ventilated. · Use gloves and protective eye wear when working with any chemical-based cleaners. · Test your grout cleaner on a small, inconspicuous area first to make sure that it won't erode or damage your grout work. This is especially necessary if your tile grout is old or damaged. · Never mix cleaners together! Chemical reactions can cause noxious fumes or burns if the mixture touches the skin. Tile grout gets dirty in many different ways. In the bathroom, it's usually mold or mildew causing the grout stains. In the kitchen it could be a combination of food stains, general household traffic and grime, and mildew. No matter what the cause of the staining, start off with the simplest and least acidic cleaning solution first, moving up to harsher chemical cleaners if you are unsuccessful in getting the grout completely clean. Watch a video on DIY grout cleaning.For some stains, simple household items like vinegar or baking soda can be effective cleaners. Use vinegar diluted with an equal amount of water, or make a paste of baking soda and a bit of water to clean the grout with. Spray or dab the cleaner onto a small length of grout and scrub with a stiff brush. Scrubbing in small circles rather than straight up and down will remove more debris from the grout. Rinse well with water and mop up and remaining moisture with a sponge or paper towels.Generic household cleaners such as Mr. Clean, Lysol, or powder-based cleaners can also work on tile grout. Use as directed above for vinegar or baking soda, and make sure to rinse the grout well after cleaning. Alternatively, if you own or have access to a steam cleaner, try using it on your grout work. The pressure of the steam cleaner can loosen debris and stains that cleaners can't dissolve.Try to find a cleanser that is pH balanced so that the chemicals in the product won't erode the grout with continued use. For heavy duty stains, use even stronger products such as oxygen bleach powder, hydrogen peroxide, or chlorine bleach. These products should be well diluted before use. You can also find heavy duty cleaners at hardware stores or janitorial supply outlets. If you go this route, however, you will need to read labels carefully and follow directions to the letter. For the best possible floor tile and grout cleaning, you can always try a helpful professsional like Cleancare. When your tile grout is completely clean, keep it looking fresh and new by applying a coat or two of grout sealer. 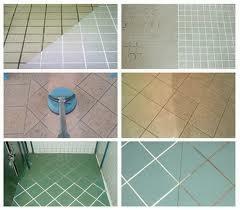 There are various types of grout sealers available for different uses, such as floors or bathroom tile. Make sure you purchase the correct type for the grout you'll be applying it to. Reapply the grout sealer at least once a year, or more often if necessary.